I usually shy away from mocking the right—it’s too easy, it’s overdone by liberals, and it’s often a gateway to apologetics for the Democrats. But this is a doozy. Seems odd, doesn’t it, that the average of the first segment, January 2009–March 2010, is +67,600 a month when the graph is below 0 for almost the whole time? Well, yes it is. The actual average change in private sector employment for that period is a decline of 327,000 a month, almost 400,000 below what Heritage says is the average. The average gain for the second period, from April 2010–June 2011, is 136,000 a month, almost 130,000 above what Heritage says it is. It looks like what Sherk did was to take the slopes of the two trendlines and compare them. But for the first period, there was only one month of actual job gain—the last month, March 2010. Sherk’s trendlines are telling you we went from deep job losses in early 2009 to modest job gains starting in early 2010, and have more or less stayed there since. Which, if you were a Dem propagandist, you could use to sell Obamacare, not damn it. Of course, Obamacare—a mostly terrible thing—has almost nothing to do with these employment trends, but then again, Heritage seems to have only an accidental relationship to truth. It will be interesting to do a similar graph in a year or two with the passage of the debt deal as the dividing point. Fiscal tightening in an already slowing economy is not a good idea, but don’t expect the Heritage Foundation to say that. I usually shy away from criticizing the right—it’s too easy, it’s overdone by liberals, and it’s often a gateway to apologetics for the Democrats ///// Good to see an article breaking this practice. Hopefully, it marks an end to tht shyness. Too easy : work ethic can be overrated; easy work but somebody, more people actually, have go to do it. When Doug says “criticizing the right” in this context, he does not mean criticizing right-wing policies (something liberals almost never do, since they would be criticizing themselves and the democratic party along with their enemies). He means criticizing right-wing political organizations and representatives – something you can see on virtually any hour of the day on NBC or moveon.org. It takes practically no effort to do the latter – it’s basically just advertising for democrats (ie “look how crazy/wrong/offensive/badly researched this [insert right-winger here] is!”) . The latter is a distraction from actual policy arguments of substance from a left perspective, which are extremely rare among liberals or anyone else. Doug – a great example for my econometrics students who need to understand how to model economic data expressed as levels, differences, and growth rates. I nominate this example for the Stephen Jay Gould “Mismeasurment of Man” Memorial Award! You have to wonder what the Heritage people thought was even remotely plausible about Sherk’s claim — apart from the overwhelming likelihood that CNN and NPR and the Times would take the claims at face value…. What possible effect could the new law have _instantaneously_? This is more of a meta-comment but, I’ve heard that Obamacare is substantially similar to what Romney did in Massachusetts. If that is true, why aren’t we calling it Romneycare? Cris – good question. They’re virtually identical. 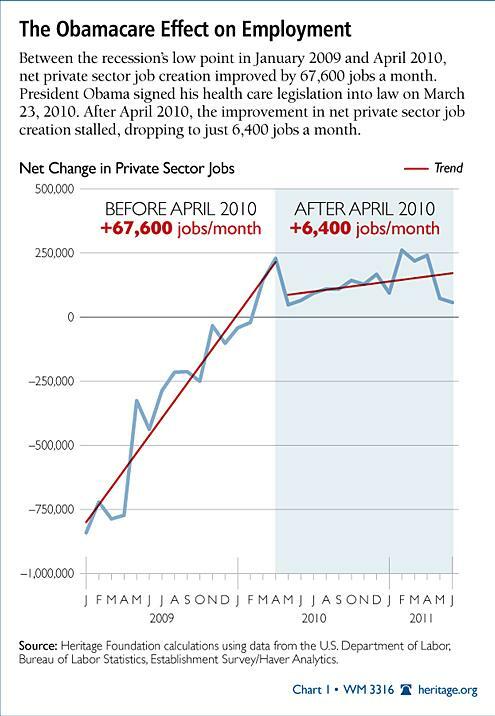 Actually, I guess the graph should be labeled “+67,000 jobs/month²” (or jobs per month per month)? Don’t these politics majors know anything about basic physics equations with acceleration!